FOXBORO, Mass. 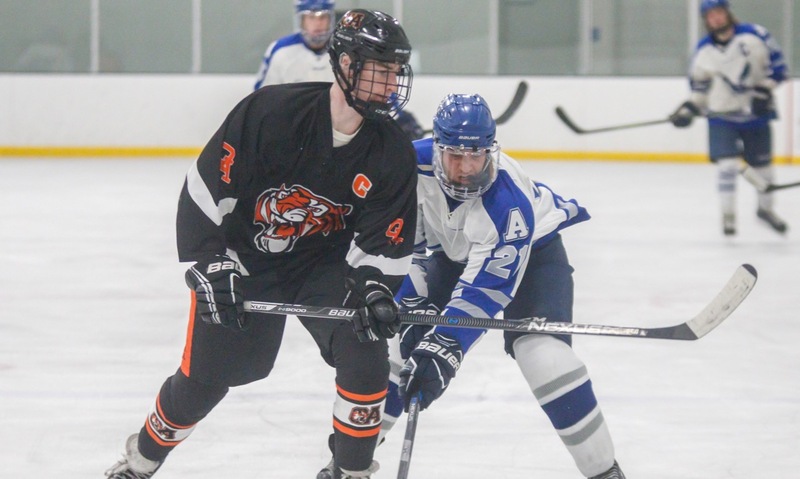 – In their third head-to-head matchup of the young season, the Norton Lancers took down the Foxboro Warriors, 5-4, thanks to two third period goals in an eventful night at the Foxboro Sports Center. The Warriors broke open the scoring with 11:44 left in the first period as Kyle McGinnis was fed by his teammate to put a shot past Norton’s Triton DosReis, giving Foxboro the early lead. That lead, however, only stood for 50 seconds as a hard slap shot down the left wing from Lancer captain Cam Trudeau found the back of the net, drawing even with 10:55 left to play in the period. 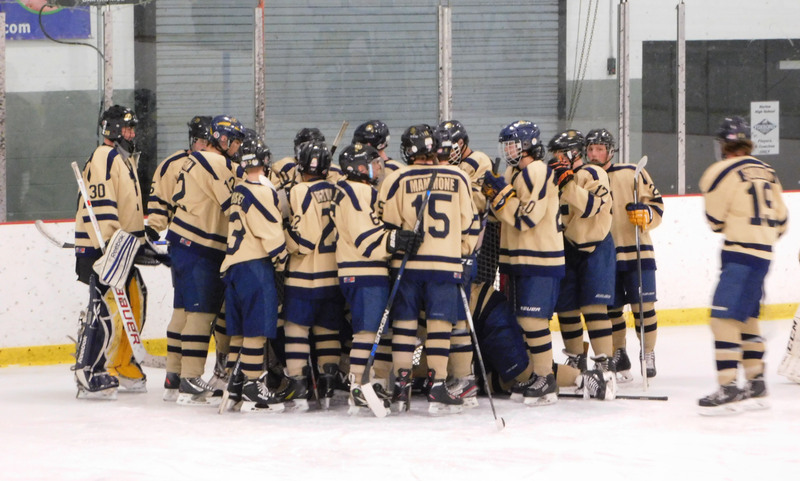 The rest of the period consisted of hard hits and chances, particularly for Norton as the Lancers continued to press offensively while Foxboro created chances when possible. The Warriors killed two power play opportunities for the Lancers. Despite chances, Norton was unable to take the lead and headed into the first intermission even with Foxboro. The second period got underway with both sides exchanging shots. While the attacks looked strong, John Cronin and DosReis were stronger in their respective nets, stopping shot after shot that came at them. Norton broke through again though with 9:21 remaining in the period as Tom Whalen slid in from the right to knock the puck past Cronin and give the Lancers the 2-1 lead. Foxboro had a power play opportunity with 9:16 remaining in the period after Brendan Heayden was sent to the penalty box. While they were unable to capitalize on the power play, the Warriors found the back of the net shortly after, as Sam Garrabrant took advantage of the rebound to bring Foxboro back even with 7:09 remaining in the period. Both teams continued their hard-hitting along the boards, but a scary moment happened with 5:00 left when a late hit hit prompted a scuffle, resulting in a game misconduct for a player on each team. The referees decided to hold off the action until tensions had cooled and the injury was tended to, calling the second intermission early, with the remainder of the second period to be played after the break. When the action resumed, Norton struck back to take the lead as Jack Lornager took a rebound off Cronin’s pads & shot it up over the diving goaltender to make it 3-2 with 2:35 left in the period. While the Lancers looked to carry their lead into the third period, the Warriors had other ideas as Mike Carresi and Josh Bertumen set up John Brolin on the blue line, and the senior defenseman delivered, sending a hard shot into the left side of net with 0:22 left in the period. With the third period getting right underway, it was still anyone’s game as both sides remained even both on the board and on the ice. Caressi gave the Warriors the lead with 14:04 left as Bertumen and Smith helped set him up for a shot in front of goal, but the Lancers struck back with 12:35 left as Tom Whalen was fed from behind the goal & slid one to the left of Cronin’s blocker to draw the game even yet again. As the period went on, Norton continued to carry momentum. Foxboro was able to counter this defensively by breaking up several breakaways, but Loranger sent the game winner past Cronin in front of a crowded net with 0:24 left, sealing the deal for the Lancers. Both teams return to action January 4th, when Foxboro (1-4) plays host to the Pope John Paul II (Barnstable) Lions, while Norton will challenge the Durfee Hilltoppers.